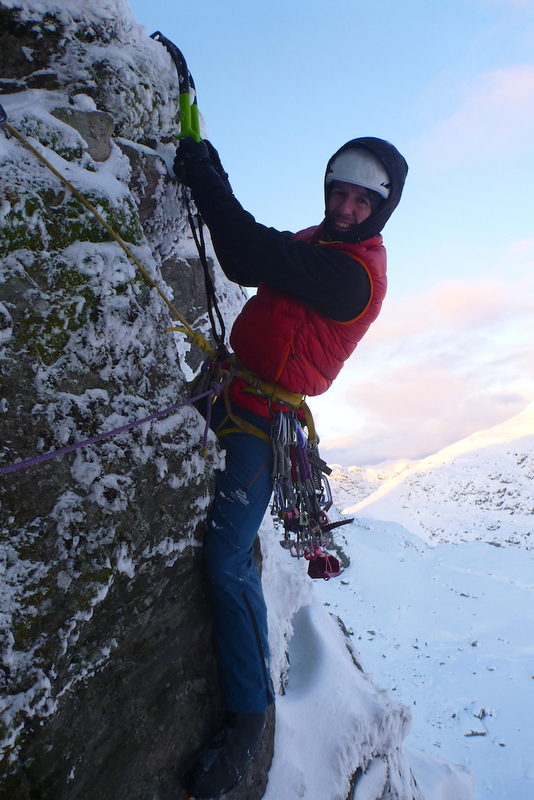 The Arrochar Alps are not just my favourite winter playground because I’m from Glasgow. I still love going there in winter even though I live under the Ben these days. Just before I moved to the highlands in 2007 I visited the south peak of the Cobbler to attempt Ken Johnstone’s summer E2 ‘Southern Freeze’. It was an obvious winter line, being festooned with luminous lumps of moss and turf. That day I discovered that the route was pretty hard and sustained. 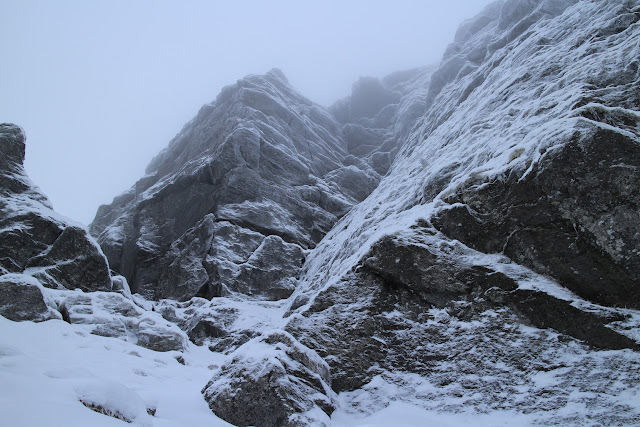 It took me around two hours of being continually pumped to climb the first 25 metres to the crux bulge. When I got there, I just didn’t have any more juice in the tank. I scraped about uselessly at the bulge, then lowered off. The Cobbler south peak in fine condition. Southern Freeze takes the left skyline through the bulges. It was always on my mind and I made a couple of abortive tries to go back, mostly finding it out of condition or poor weather. 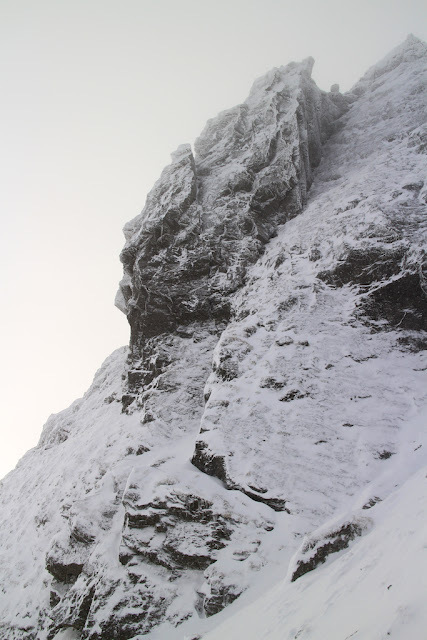 On Friday we knew the Cobbler would be in excellent condition and Helen Rennard and I made a difficult journey down from Lochaber in heavy snow. The walk was similarly slow and I started up the wall at noon. The same delicate, pumpy and at times scary two hours later, I arrived back at my highpoint. But this time, either with recent training paying off, or the benefit of experience, I had power left in my arms. After a short rest I climbed quickly and confidently across the bulge, finding the hooks more quickly than I expected. I didn’t take more than a split second to take in the exhilarating position on the lip. I was far too busy grunting and eyeing up the tufts above. Once Helen had warmed up and joined me at the belay, I swung around an easy bulge and cruised up the much easier corner above, taking in the spectacular afternoon light looking down the Clyde and across to Ben Lomond. After a very busy (18 hour) work day the next day, I picked Helen up at 5am, two hours after I’d got to bed and was feeling decidedly unmotivated as we drove back south to go for Mammoth (IX,9) on The Brack. I was even less psyched meeting Stuart the Postie in the car park, who confidently predicted the turf would not be frozen on such a low mountain. I still thought the steep open walls would be frozen even if the grade Vs with deep corners would be insulated by the snow. I had been so busy with work the day before, I hadn’t got time to look at Mammoth’s description. I just knew it took steep cracks right of the big arete on the crag. What the hell, it probably wouldn’t be white/frozen anyway. Well it turned out to be both white and frozen! I climbed a 10 metre corner to the first steep crack and launched up this. It looked desperate and under the liberal plastering it took me ages hanging right on the steepest bit trying to find the hooks to pull over. Eventually I spotted a wee flake and the move was easy! If only I hadn’t had the 30 minute workout to find it. Mammoth looking in great condition. At the next belay I could see this was a logical place to climb the crack on the left as Guy had mentioned in his blog. But that was the third pitch? I suddenly realised I must have missed out the initial 10m pitch which is rather indirect off to the left of the main line of cracks. Idiot. Oh well, there wasn’t much I could do about it now! So I just got stuck into the next tech 9 pitch. Guy had mentioned perfect protection but the crack today was choked with ice and not accepting gear readily. 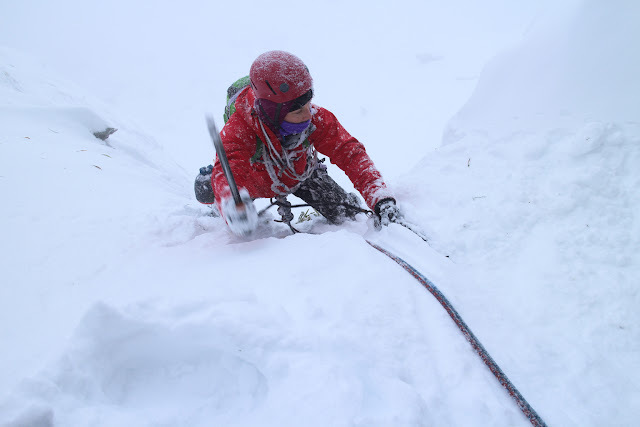 On the overhanging part, I got a killer no-hands kneebar which helped a lot to buy me enough time to fiddle wires into the icy crack. Later Helen said she just touched them and they fell out. I managed to complete the pitch without getting too pumped and still felt like I had plenty of energy. I think my recent training changes have another thumbs up. 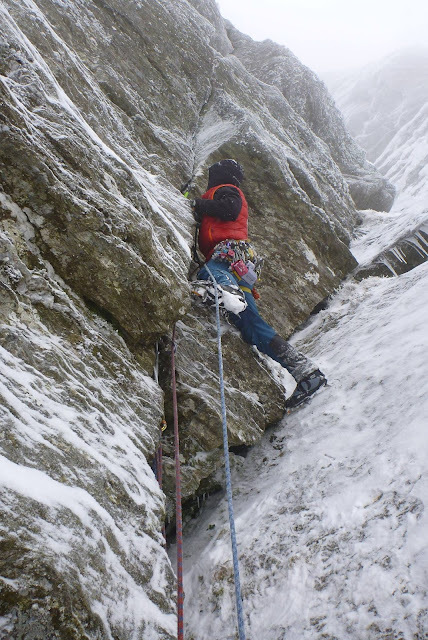 The last pitch was thankfully a bit more chilled tech 7 which I enjoyed despite getting cold hands. We abseiled back down the wall and with my head torch beam I sussed out where we went wrong on the first pitch. I suggested to Helen that I just tie in and do the pitch for completeness, but she was shivering and not making keen noises, so we kept going down. Next time I’ll make a point of reading the guidebook. 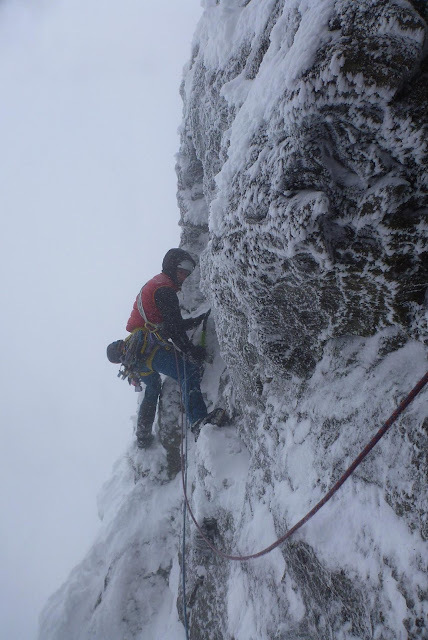 Heading out left to the turfier crack o the net tech 9 pitch. I got a handy kneebar right at the hardest bit. Handy because I fumbled my wires and nearly dropped all of them. Both routes were a brilliant reminder of how good Southern Highlands mixed climbing is. Mammoth is a fantastic pumpy line and quite low stress since it’s well protected. 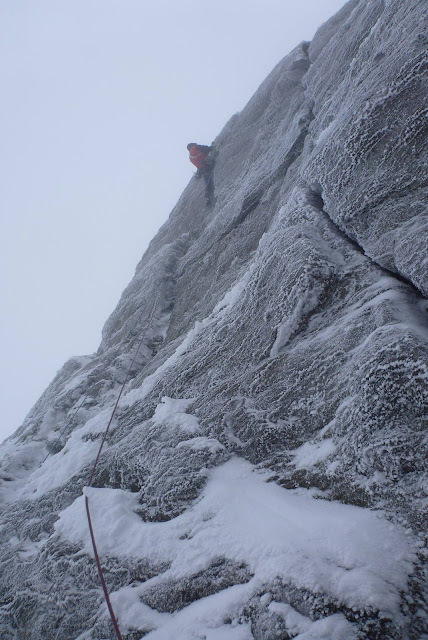 Although we annoyingly missed out on the first bit, the climbing on Southern Freeze was a good bit harder overall so I think I’ll suggest IX,9 for that as well. 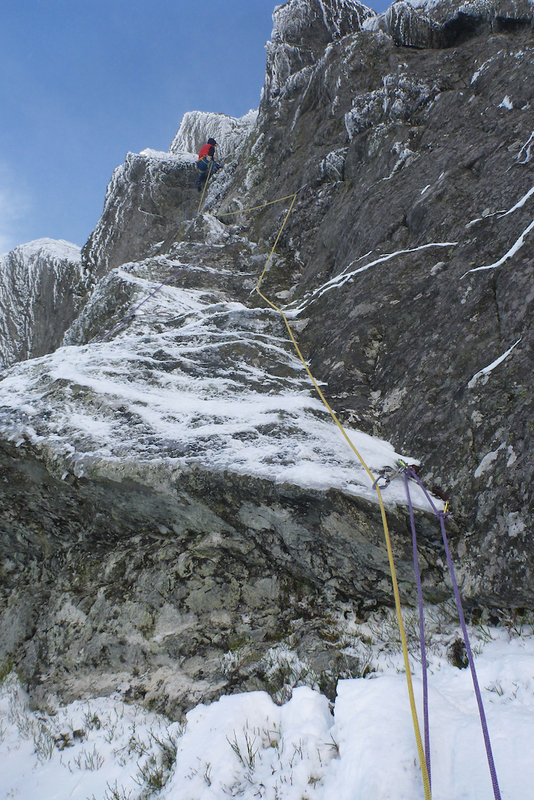 I’m also beginning to wonder if two of my new routes on the Ben back in March (High Pressure Crack and Red Dragon) could potentially be IX as they had harder climbing. A fun start to the mixed season, even though I’m about to leave for Catalunya.